I have plenty of heroes, but right now, I'm just going to say a bit about my grandfather, Robert Benjamin Horton. R.B. was a hero to me and many others. He had an undeniable presence about him and was respected like very few men I've ever met. R.B. was kind, but strong. He was an avid hunter and fisherman in his leisure time, leading a motley crew of old Florida crackers in their yearly 4x4 pursuit of the elusive whitetail from his hunting camp base (Camp Welcome) in the hammocks, marshes, and dunes of St. Augustine's Dupont Center. I'll never forget my days in the woods with the big-boss-man, R.B., giant ole scrapper Jimmy Brooks (ex-Sea Bee), my great-uncle Leon, with his "possum-feathered" cowboy hat, my great, granddaddy "Chief" Al Smith, who for mysterious reasons, always needed a nap by mid-afternoon, Ronald Corbin, the man most likely to know where the deer would actually be (next to R.B. ), and my own dear Dad, who stood with a sly smile, his favourite .44 Mag Ruger carbine in hand, while my grandfather "embellished" his jokes. What an incredible bunch of men to try to live up to. I'll never do it, but I'm giving it a shot. He was a hard worker from his youth, first in the timber woods and sawmills of North Florida, to the boat yards of St. Augustine, where he supervised at DESCO shipyards. Heck, when I was a kid, we couldn't go anywhere without someone going, "How are you, Mr. R.B., sir?". I always felt like I was grandson of some Southern general, then I soon realized every cracker in St. Johns county and the surrounding areas had either worked with or for my "Granddaddy", which didn't make me feel much different. from the death and destruction, in the Philippines. Man, he's sharp, ain't he? This same man, served his country well during WW II, to no surprise. 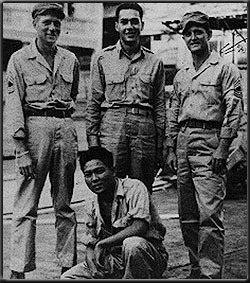 He came home a very decorated veteran, with four years of service in New Guinea and the Philippines, after beating the "Japs". I know he had some fun over there. I have photos of him wearing grass skirts, dancing, and smiling a storm, but I also have pictures he brought back, which I wouldn't show here, that really display the horror of war. And, beyond that, I've also heard the most masculine man I ever met, scream in the night, from nightmares of the slaughter of war. Something, so terrifying, it brings tears to my eyes to recall. If you want to find the ideal of a Southern gentleman, proud white American, and original Florida Cracker, look no further. I miss him more than words, and am honoured to have known him, much more to be descended from him. And, I'm glad to know when I leave this earth, and go to be with Jesus, I'll be able to see him again. We'll get up early, have some fat sausage links, fried eggs, toast, and grits; spend the morning running the dogs, eating "Vienner" (vy-ee-ner) sausages and Ritz crackers, maybe even take a pop at a 12-point buck, and then have a good old Cracker reunion afternoon, with a plate of Grandma's chicken and rice, some grilled oysters, a couple small sea trout or "Pompey Jack" fillets, some pecan pie (that's pea-can), and a bowl of Granddaddy's fresh "swamp cabbage". We'll sit by an old scrub oak, eat some salted watermelon, and try not to annoy the women-folk with our bragging-too-much about the day's events.